SPRINT-2 demonstrated that boceprevir (BOC), an oral hepatitis C virus (HCV) nonstructural 3 (NS3) protease inhibitor, added to peginterferon alfa-2b (P) and ribavirin (R) significantly increased sustained virologic response rates over PR alone in previously untreated adult patients with chronic HCV genotype 1. We estimated the long-term impact of triple therapy vs. dual therapy on the clinical burden of HCV and performed a cost-effectiveness evaluation. A Markov model was used to estimate the incidence of liver complications, discounted costs (2010 US$), quality-adjusted life years (QALYs), and incremental cost-effectiveness ratios (ICERs) of three treatment strategies for treatment-naïve patients with chronic HCV genotype 1. The model simulates the treatment regimens studied in SPRINT-2 in which PR was administered for 4 weeks followed by: 1) placebo plus PR for 44 weeks (PR48); 2) BOC plus PR using response guided therapy (BOC/RGT); and 3) BOC plus PR for 44 weeks (BOC/PR48) and makes projections within and beyond the trial. HCV-related state-transition probabilities, costs, and utilities were obtained from previously published studies. All costs and QALYs were discounted at 3%. The model projected approximately 38% and 43% relative reductions in the lifetime incidence of liver complications in the BOC/RGT and BOC/PR48 regimens compared with PR48, respectively. Treatment with BOC/RGT is associated with an incremental cost of $10,348 and an increase of 0.62 QALYs compared to treatment with PR48. Treatment with BOC/PR48 is associated with an incremental cost of $35,727 and an increase of 0.65 QALYs compared to treatment with PR48. The ICERs were $16,792/QALY and $55,162/QALY for the boceprevir-based treatment groups compared with PR48, respectively. The ICER for BOC/PR48 compared with BOC/RGT was $807,804. The boceprevir-based regimens used in the SPRINT-2 trial were projected to substantially reduce the lifetime incidence of liver complications and increase the QALYs in treatment-naive patients with hepatitis C genotype 1. It was also demonstrated that boceprevir-based regimens offer patients the possibility of experiencing great clinical benefit with a shorter duration of therapy. Both boceprevir-based treatment strategies were projected to be cost-effective at a reasonable threshold in the US when compared to treatment with PR48. Infection with hepatitis C virus (HCV) is a major global public health problem. According to the World Health Organization statistics, approximately 130–170 million people are currently infected with chronic HCV worldwide . In the United States (U.S.) and Europe, HCV is the leading cause of chronic liver disease and the leading indication for liver transplantation [2–5]. HCV infection represents a substantial clinical and economic burden in the U.S. [6, 7]. For example, it is estimated that 3.2 million persons are chronically infected  and that HCV infection causes approximately 15,000 deaths annually . The total 2011 healthcare cost associated with HCV in the U.S. was estimated at $6.5 ($4.3–$8.4) billion . Generally, it takes several years – possibly decades – between infection with HCV and development of serious liver disease. Hence, although the incidence of acute HCV infection is declining, the prevalence of cirrhosis and incidence of HCV-related liver disease is expected to increase over the next 10–20 years . There are 6 major HCV genotypes . Approximately 70% of HCV infected people in the U.S. have genotype 1, which is the most difficult-to-treat . Prior to 2011, the standard of care for chronic HCV genotype 1 infection was 48 weeks of antiviral (AV) treatment with a combination of a pegylated interferon alfa and ribavirin . With peginterferon alfa-2a or alfa-2b and ribavirin treatment, less than 50% of treatment-naïve genotype 1 patients achieve a sustained virologic response (SVR) [14, 15]. Patients with advanced liver disease and of African-American descent have an even lower likelihood of attaining an SVR with this treatment regimen (20%–30%) . In 2011, HCV protease inhibitors obtained regulatory approval and became available to treat patients infected with HCV genotype 1. The addition of HCV protease inhibitors, boceprevir and telaprevir, to peginterferon alfa and ribavirin have led to markedly higher SVR rates [17–20]. As a result, the American Association for the Study of Liver Diseases (AASLD) guidelines were updated in 2011 to recommend including the protease inhibitors in the treatment regimens of patients infected with HCV genotype 1 . The objective of this study was to assess the clinical impact and cost-effectiveness of the boceprevir-containing regimens that were studied in the Serine Protease Inhibitor Therapy 2 (SPRINT-2) trial in treatment-naïve patients. The secondary objective was to evaluate the cost-effectiveness of boceprevir-based treatment strategies compared to treatment with dual therapy in pre-specified subsets of the population and in sensitivity analyses. The projections are based on a decision analytic model that integrates data from public sources, published literature, and clinical trial databases under a clearly specified set of assumptions. SPRINT-2 (ClinicalTrials.gov number, NCT00705432) was a Phase 3, international, randomized, double-blinded placebo-controlled study comparing the safety and efficacy of therapy with peginterferon alfa-2b and ribavirin (PegIntron and Rebetol, respectively; Merck) with two treatment regimens that added boceprevir (Victrelis, Merck) after a 4-week lead-in treatment period with peginterferon–ribavirin alone . SPRINT-2 was conducted in accordance with the principles of Good Clinical Practice. The study protocol and study design were approved by each of the sites institutional review board and regulatory agencies, and each participant provided written informed consent before undergoing any study-related procedure. A list of the institutional review boards that approved the study protocol and study design is provided in Additional file 1: Table S1. The full study protocol is available at http://www.nejm.org/action/showSupplements?doi=10.1056%2FNEJMoa1010494&viewType=Popup&viewClass=Suppl. Previously untreated patients (N = 1097) ≥18 years of age with genotype 1 chronic HCV and plasma HCV-RNA level ≥10,000 IU/mL were eligible. Because of the known marked difference in SVR rates with peginterferon–ribavirin between black and non-black patients , self-identified blacks and non-blacks were enrolled separately into two cohorts. Exclusion criteria included liver disease of other etiology, decompensated cirrhosis, renal insufficiency, HIV or hepatitis B, pregnant/breast feeding women, or active malignancy. Liver biopsies were assigned METAVIR fibrosis and steatosis scores by a single pathologist who was unaware of treatment assignment. Peginterferon alfa-2b was administered subcutaneously at 1.5 μg/kg once weekly. Ribavirin was administered using weight-based dosing of 600–1400 mg/day (divided daily dose). Boceprevir was administered orally at a dose of 800 mg three times daily (to be taken with food and with an interval of 7 to 9 hours between doses) in four capsules of 200 mg each. Placebo was matched to boceprevir. The study was double-blinded regarding the administration of boceprevir. All patients received peginterferon–ribavirin during the 4-week lead-in period. Patients randomized to control received peginterferon–ribavirin treatment for 44 weeks after the lead-in period, as well as placebo three times daily beginning at week 5 (PR48). The overall SVR rate in the PR48 arm of SPRINT-2 was 38% (137/366) for both cohorts, 40% (125/311) for the non-black, and 23% (12/52) for the black cohort . Patients randomized to the response-guided therapy (BOC/RGT) regimen received peginterferon–ribavirin plus boceprevir for a total of 24 weeks after the lead-in period; if HCV-RNA levels were undetectable from week 8 through week 24, treatment was considered complete, but if HCV-RNA levels were detectable at any visit from week 8 up to but not including week 24, peginterferon–ribavirin was continued, and placebo was administered at week 28 through week 48. The overall SVR rate in the BOC/RGT arm of SPRINT-2 was 63% for both cohorts (233/368), 67% (211/316) for the non-black, and 42% (22/52) for the black cohort . Patients randomized to the third regimen received peginterferon–ribavirin plus oral boceprevir for 44 weeks after the lead-in period (BOC/PR48). The overall SVR rate in the BOC/PR48 arm of SPRINT-2 was 66% for both cohorts (242/366), 68% (213/311) for the non-black, and 53% (29/55) for the black cohort . In each arm, patients with detectable HCV-RNA at week 24 discontinued treatment as a standard futility rule. Boceprevir was given for 24 weeks in the BOC/RGT arm and 44 weeks in the BOC/PR48 arm. All patients were followed through week 72. We created an Excel-based (Microsoft Corp., Redmond, Washington) Markov model to project health-related outcomes and to estimate the expected costs and quality adjusted life-years (QALYs) associated with the three treatment strategies studied in SPRINT-2. The structure of the model was based on other published health economic models of HCV disease [22–27]. The model consists of two phases: the first phase corresponds to the treatment strategies and follow-up period and the second phase corresponds to post-treatment, which includes the natural history of HCV of cured or uncured patients (Figure 1). Schematic Diagram of HCV Therapy and Disease Progression. Y – yes; N – no; Tx – treatment; ETR – end of treatment response; SVR – sustained virologic response; F0 – no fibrosis; F1 – portal fibrosis without septa; F2 – portal fibrosis with few septa; F3 – numerous septa without cirrhosis; F4 – cirrhosis; DC – decompensated cirrhosis; HCC – hepatocellular carcinoma; LT – liver transplantation; PLT – post-liver transplantation; Lv-death – liver-related death. Patients entered the model with chronic HCV and immediately began AV drug therapy. The treatment phase of the model includes a weekly cycle length in which patients can stop therapy early for a variety of reason (i.e. discontinued due to standard futility rule, adverse events, or other non-medical reasons). Patients with undetectable HCV-RNA at the end of treatment were followed for an additional 24 weeks. Patients with undetectable HCV-RNA after 24 weeks of follow-up achieved an SVR. Relapse was defined as the occurrence of undetectable HCV-RNA at the end of treatment, but detectable HCV-RNA after the 24 week follow-up period. In the model, patients who experienced relapse returned to the chronic HCV health states. Patients who failed to pass a futility rule or who had detectable HCV-RNA at the end of treatment were considered treatment failures and also returned to the chronic HCV health states. The second phase of the model uses cycles with a length of one year and describes patient outcome post-treatment. After the trial follow-up period (72 weeks), patients either attained an SVR or returned to the natural health states of HCV. The severity of chronic HCV infection was defined by the degree of fibrosis using the METAVIR scoring system: no fibrosis (F0), portal fibrosis without septa (F1), portal fibrosis with few septa (F2), numerous septa without fibrosis (F3), and cirrhosis (F4). Patients with mild or moderate chronic HCV at baseline, described by a METAVIR fibrosis score of F0-F3, who attained an SVR were considered permanently cured; cirrhotic patients who attained an SVR were considered partially cured. Patients who were permanently cured were considered to be neither at risk for developing further HCV-related liver complications nor for reinfection. Patients with cirrhosis at baseline continued to be at risk for developing advanced stages of liver complications associated with cirrhosis even if they achieved SVR; however, for cirrhotic patients who attained an SVR the probability of developing advanced stages of liver complications was less than that of an untreated cirrhotic patient . Patients who failed to achieve an SVR returned to the natural HCV health states and were at risk for developing serious liver disease and could receive a liver transplant at the same rate as patients who did not receive treatment. The model simulates the natural history of chronic HCV and advanced liver-related diseases and its treatment, consistent with the current understanding of the biology of chronic HCV-related liver disease and its treatment (e.g., liver transplant). The progressive disease model assumed that during one cycle, a person with a given fibrosis score could progress to the next fibrosis level of severity or could remain in that current health state. In the absence of successful treatment, regression to less severe health states, or spontaneous clearance of the virus, was not permitted. Patients with compensated cirrhosis were at risk for developing the sequelae of cirrhosis - decompensated cirrhosis (DC) and hepatocellular carcinoma (HCC). Patients who developed DC and/or HCC could receive a liver transplant. Because of differential mortality, costs and quality of life between the first year and subsequent years of these health states, they were divided into two states: DC, first year and DC, subsequent years; HCC, first year and HCC, subsequent years; and the Liver Transplant and Post-Liver Transplant states. The Liver Transplant health state lasted a total of 1 year. If a patient was alive at the end of 1 year, then the patient transitioned to the Post-Liver Transplant state. Patients who received a liver transplant were assumed to be at no risk of reactivation and progression to liver disease. The mortality risk of the general population was applied to all states in the model. In addition, an excess mortality rate was applied to patients with DC, HCC, or who received a liver transplant. The model required information describing the patient characteristics for the treatment population as well as model inputs describing treatment characteristics, clinical inputs, costs and utility values associated with AV therapy and the HCV health states (Tables 1, 2 and 3). The patient characteristics of the cohorts and the treatment characteristics were obtained from SPRINT-2. Baseline values and plausible ranges to be used in deterministic and probabilistic sensitivity analyses for model inputs describing the clinical characteristics of HCV and the utility values applied to each of the health states were obtained from published studies. All clinical inputs used in the model are summarized in Table 3. PR48 – peginterferon-ribavirin regimen for 48 weeks; BOC/RGT – peginterferon-ribavirin and boceprevir for 24 weeks, and those with a detectable hepatitis C virus (HCV) RNA level between weeks 8 and 24 received peginterferon–ribavirin from week 28 to week 48; BOC/PR48 –peginterferon–ribavirin for 48 weeks and boceprevir for 44 weeks. SVR – sustained virologic response; F0 – no fibrosis; F1 – portal fibrosis without septa; F2 – portal fibrosis with few septa; F3 – numerous septa without cirrhosis; F4 – cirrhosis; DC – decompensated cirrhosis; HCC – hepatocellular carcinoma; AV therapy – antiviral therapy. As patient characteristics impact the efficacy of the treatment regimens and the annual mortality rate, the analyses were conducted on a cohort of persons with chronic HCV genotype 1 who were representative of participants in SPRINT-2. In the model, a series of 20 cohorts progressed through each treatment regimen. The cohorts represent all possible combinations of gender, race cohort, and baseline METAVIR fibrosis score (2 × 2 × 5 = 20). The average age of the overall SPRINT-2 study cohort was applied to all patients in the analysis. The reported distributions of gender, baseline fibrosis level, and race cohort from SPRINT-2 were assumed for the treatment population (17, Table 1). Treatment characteristics were obtained from reported data in SPRINT-2 (Table 2). We assumed that patients experienced the same treatment efficacy, discontinuation rates, treatment-related anemia, and utilized erythropoietin (EPO) to treat anemia as observed in SPRINT-2. Clinical inputs described the rate of HCV progression, the probability of receiving a liver transplant, and all-cause and liver-related mortality rates and were used in the model to determine the amount of time patients spend in each HCV health state (Table 3). The literature search resulted in a wide range of values for progression rates [52, 53]. We used the progression rates from Thein et al. , a recent meta-analysis of published progression rates from 111 studies of individuals with chronic HCV infection. They provided stage-specific progression rates by fibrosis level, as described using the METAVIR scoring system. The meta-analysis demonstrated that the progression rates are not linear and are generally higher in the initial stage F0 to F1 than the transitions between the stages with more fibrosis (i.e. F1 to F2). The estimates were also adjusted for biases attributable to study design and selection factors associated with study population and clinical characteristics. The annual probability of developing advanced stages of liver complications associated with cirrhosis was derived from published studies. The baseline likelihood of developing DC from compensated cirrhosis was estimated using a weighted average of the annual incidence rates reported in five natural history studies of 1,276 cirrhotic patients [30–34]. Similarly, the annual transition rate from compensated cirrhosis to HCC was estimated using a weighted average of the annual incidence rates reported in nine natural history studies of 1,905 cirrhotic patients [30–38]. The baseline likelihood of developing HCC from DC was estimated from a study by Planas et al. that followed 200 patients with DC. The estimates for the transition rates to DC and HCC in cirrhotic patients who achieved SVR were obtained from a study by Cardoso et al. . Previously published U.S. based cost-effectiveness models estimated the probability of receiving a liver transplant from DC using Bennett et al. , which estimated the prevalence of DC using mortality rates from a 1987 study by Gines et al. and 1994 data from United Network of Organ Sharing (UNOS) and the Division of Organ Transplantation . In our model, this estimate was updated to take into account the increase in survival rates, prevalence of patients with liver decompensation, and changes in liver-transplant practice that have occurred since 1994. According to the analysis of the Scientific Registry of Liver Transplant Recipients (SRTR) data, from 1999 to 2007, the number of recipients with HCV increased to a peak of 2,481 in 2006 and remained relatively stable at around 2,400 transplants annually thereafter . In addition, HCV-related DC became more common after 1995 with the prevalence in 2010 estimated as 103,117 . We estimated the annual probability of receiving a liver transplant from DC by dividing the most recent data for the number of HCV-related liver-transplants with the prevalence of HCV-related DC, i.e. 2400/103117 = 2.3%. Although the number of liver transplants has increased, our estimate is lower than that assumed in previous studies (3.1%) primarily because of a substantial increase in the prevalence of DC. The annual probability of patients with HCC receiving a liver transplant was estimated as 4.0% using a study by Lang et al. .
We used gender and age-specific all-cause mortality rates from the 2006 U.S. life tables to describe the risk of mortality associated with all states in the model . In addition, an excess mortality rate associated with decompensation of the liver was estimated from Planas et al. and probability of death from HCC was obtained from Fattovich et al. . Liver-transplant related mortality was estimated from the most recent data available on liver transplants using the study by Wolfe et al. . The model was developed from the payer perspective. We included the cost of AV therapy and management of HCV disease in patients who did not achieve SVR. All costs were expressed in terms of 2010 US dollars. AV therapy costs include drug costs, the cost of managing treatment-related anemia, and monitoring costs for patients on therapy. AV drug costs were calculated using the weekly costs of peginterferon and the generic version of ribavirin, assuming a daily dose of 1000 mg . The weekly cost of boceprevir was assumed to be $1100. The drug costs accounted for the discontinuation of treatment due to the standard futility rule, adverse events, or other non-medical reasons. As ribavirin is administered using weight-based dosing, the average weight of patients was used to determine the cost of ribavirin. The average costs applied to each natural HCV health state were derived from published studies. The costs of treating chronic HCV and compensated cirrhosis were based on a retrospective, matched cohort claims database study . The reported costs were modified by subtracting the AV therapy costs reported by patients with a METAVIR score of F0–F4 and by adjusting the inpatient hospitalization costs using the national hospital cost-to-charge ratio. McAdam-Marx et al. only reported an aggregated cost for the F0–F3 health states. The disaggregated costs of ''HCV without liver disease" were estimated by taking into account the relative contribution of mild (F0, F1), moderate (F2), and severe (F3) to the total HCV-related cost reported in Davis et al. . Future costs were discounted at 3% per year. Utility weights for each of the health states and liver disease conditions were applied to the utilities of the general population. The utility weights were estimated from a previously published study of patients with chronic HCV  and adjusted to the U.S. population norm by using age- and gender-specific utility weights of the U.S. general population . There are limited data on the impact of treatment on health-related quality of life. Side effects associated with pegylated interferon and ribavirin are well-documented and include IFN-induced bone marrow depression, flu‒like symptoms, neuropsychiatric disorders, autoimmune syndromes, and anemia . In addition to these side effects, the boceprevir-based regimens were also associated with a higher probability of anemia and dysguesia . The magnitude of the decrement in quality of life associated with the side effects of boceprevir has not been empirically quantified. In our analysis, we assumed that patients who do not experience side effects experienced the same decrement in quality of life regardless of their treatment strategy (PR48 vs. BOC/RGT and BOC/PR48). Similarly, we assumed that patients with incident anemia experienced the same decrement in quality of life regardless of their treatment strategy. We used previously published estimates to quantify the impact of AV therapy on the quality of life for patients with chronic HCV without incident anemia . The impact of incident anemia on the quality of life for patients who are receiving AV treatment for HCV was estimated from a study of the impact of anemia on the quality of life of patients with cancer . Differences in the average quality of life amongst the regimens for patients on AV therapy are due to differences in the proportion of patients experienced anemia. For patients who are cured by treatment, we assumed that an SVR following treatment eliminates all decrements in health-related quality of life associated with living in the chronic HCV infection state. Future QALYs were discounted at 3% per year. The model was run for each of the specified 20 patient profiles. An overall weighted average of the results was generated based on the distribution of the patient characteristics assumed for a given analysis. The model projected the lifetime incidence of serious liver complications, total costs, and QALYs associated with each treatment strategy as well as no treatment. In addition, the incremental cost-effectiveness ratios (ICERs) of boceprevir-based regimens compared with treatment with peginterferon and ribavirin alone as well as for PR48 compared with no treatment were estimated. Extensive sensitivity analyses on inputs were performed to estimate their impact on the total costs and QALYs of the boceprevir-based regimens and the dual therapy regimen. Specifically, we examined the effect of varying the values of inputs related to SVR rates, progression rates, cost, and quality of life weights in both one-way and multivariate sensitivity analyses. In the sensitivity analyses, the lower and upper bounds of the transition rates and QALYs were obtained from published studies; the costs were varied by increasing and decreasing the base case values by 25%; and the lower and upper bounds of the SVR rates were obtained from the bounds of their respective 95% confidence intervals on the reported values. In the multivariate sensitivity analyses, we applied the lower and upper bounds of all similar variables (i.e. the lower bounds of all progression rates). In addition, a probabilistic sensitivity analysis (PSA) was conducted to examine the impact of varying these covariates simultaneously. The baseline values, range of values examined in sensitivity analyses, distribution of parameters assumed for the PSA, and references for clinical, economic, and utility parameters are included in Table 3. The baseline values, range of values examined in sensitivity analyses, and distribution of parameters assumed for the PSA for the treatment efficacy rates are included in Table 2. The results of the PSA were based on 10,000 Monte Carlo simulation runs. Patients in SPRINT-2 were randomized by race cohort to each of the three treatment groups and the data was analyzed separately in the primary efficacy analysis. Hence, subgroup analyses were generated for each race cohort (non-black vs. black). Because the recommended treatment regimen for boceprevir use in the U.S. is not exactly as was studied in the trials, we conducted a supplemental analysis depicting the Food and Drug Administration (FDA)-approved label  recommendations by modifying the treatment strategy phase in the model and reanalyzing the data from SPRINT-2. The label includes different treatment strategies for patients without cirrhosis and patients with cirrhosis. The recommended treatment strategy for patients without cirrhosis is similar to the BOC/RGT arm in SPRINT-2 and the recommended treatment strategy for patients with cirrhosis is similar to the BOC/PR48 arm in SPRINT-2. Model modifications include estimating the treatment characteristics for patients based on their baseline cirrhosis status (METAVIR score of F0–F3 vs. F4), and accounting for an additional futility rule at week 12. Over the lifetime of this cohort, our model predicted that treatment with PR48 will result in relative decreases in the cumulative incidence by 37% in DC, 38% in HCC, 38% in liver transplants, and 38% in liver-related deaths compared to no treatment. The total discounted lifetime costs and QALYs associated with no treatment are $37,230 and 13.67, respectively. The total discounted lifetime costs and QALYs associated with PR48 treatment are $58,761 and 14.55, respectively. The corresponding ICER comparing PR48 treatment with no treatment is $24,435/QALY. The model projected the lifetime cumulative risk of developing HCV-related liver complications associated with each of the treatment strategies studied in SPRINT-2 over time (Figure 2). Over the lifetime of this cohort, our model predicted that treatment with BOC/RGT will result in relative decreases in the cumulative incidence by 38% in DC, 39% in HCC, 38% in liver transplants, and 38% in liver-related deaths compared to treatment with PR48. This implies that treating 21 patients with BOC/RGT instead of PR48 will avoid 1 case of DC; treating 17 patients will avoid 1 case of HCC; treating 116 patients will avoid 1 liver transplant; and treating 13 patients will avoid 1 liver-related death. Similarly, our model predicted treatment with BOC/PR48 will result in relative decreases in the cumulative incidence by 42% in DC, 43% in HCC, 42% in liver transplants, and 42% in liver-related deaths compared to treatment with PR48. This implies that treating 19 patients with BOC/PR48 instead of PR48 will avoid 1 case of DC; treating 15 patients will avoid 1 case of HCC; treating 104 patients will avoid 1 liver transplant; and treating 12 patients will avoid 1 liver-related death. In addition, treatment with BOC/RGT and treatment with BOC/PR48 are associated with overall increases in life expectancy of 0.97 and 1.07 years, respectively, when compared with PR48 treatment. Cumulative risk of developing HCV liver-related complications, by SPRINT-2 Treatment Strategy, over time. DC – decompensated cirrhosis; HCC – hepatocellular carcinoma; LT – liver transplantation; LD – liver-related death; PR48 – peginterferon-ribavirin regimen for 48 weeks; BOC/RGT – peginterferon-ribavirin and boceprevir for 24 weeks, and those with a detectable hepatitis C virus (HCV) RNA level between weeks 8 and 24 received peginterferon–ribavirin from week 28 to week 48; BOC/PR48 –peginterferon–ribavirin for 48 weeks and boceprevir for 44 weeks. The total discounted lifetime costs and QALYs associated with each treatment strategy are summarized in Table 4. The ICERs of both boceprevir-based regimens were calculated in comparison with the PR48 treatment arm. Although the AV therapy costs of BOC/RGT and BOC/PR48 are considerably higher ($47,582 and $69,928) than the AV therapy costs of PR48 ($29,573), the projected costs of managing HCV and HCV-related liver disease in patients who received boceprevir-based treatment were 37%–42% lower than that in patients who received PR48. Compared to treatment with PR48, the ICER for treatment with BOC/RGT was $16,792/QALY and the ICER for treatment with BOC/PR48 was $55,162/QALY. The ICER for treatment with BOC/PR48 compared with BOC/RGT was $807,804/QALY. AV therapy – antiviral therapy; SVR – sustained virologic response; F0 – no fibrosis; F1 – portal fibrosis without septa; F2 – portal fibrosis with few septa; F3 – numerous septa without cirrhosis; F4 – cirrhosis; QALY – quality-adjusted life years; ICER – incremental cost-effectiveness ratios; PR48 – peginterferon-ribavirin regimen for 48 weeks; BOC/RGT – peginterferon–ribavirin for 4 weeks followed by peginterferon-ribavirin and boceprevir for 24 weeks, and those with a detectable hepatitis C virus (HCV) RNA level between weeks 8 and 24 received peginterferon–ribavirin from week 28 to week 48; BOC/PR48 –peginterferon–ribavirin for 48 weeks and boceprevir for 44 weeks. The ICERs compared with PR48 from the one-way sensitivity analyses of chronic disease progression rates, rate of developing advanced liver disease, all health state costs, and most utility values were within $6 K/QALY and $11 K/QALY of the BOC/RGT (range: $1,747 to $42,983/QALY) and BOC/PR48 (range: $21,016 to $88,789/QALY) base-case ICERs, respectively (See Additional file 2: Table S2 online). The ICERs that fell out of these ranges were obtained when the lower bound of the quality of life of the SVR state for patients who had a baseline METAVIR score of F1 was assumed (BOC/RGT: $25,685 and BOC/PR48: $87,264) and when assumptions concerning treatment efficacies were varied. When the efficacy of PR48 was assumed to be 45.4%, the upper limit of the 95% confidence bound, and the efficacies for BOC/RGT and BOC/PR48 remained the base case values, the ICERs of BOC/RGT and BOC/PR48 increased to $29,369 and $81,237, respectively. 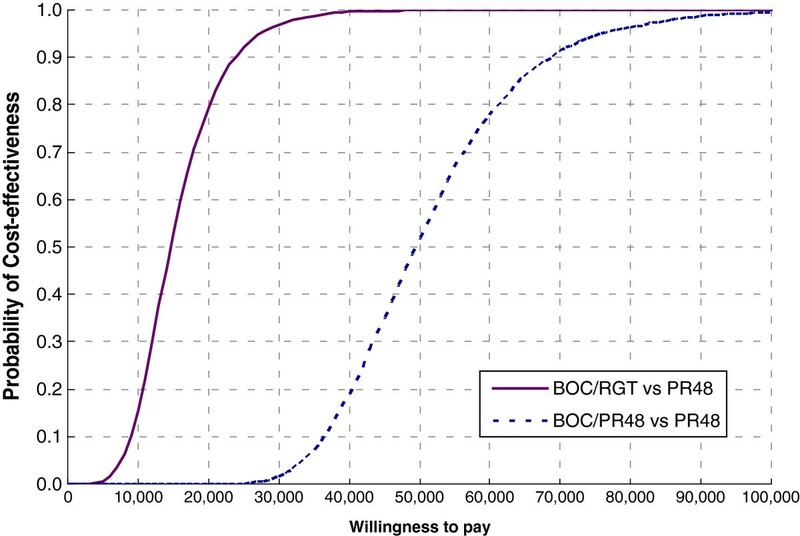 Conversely, when the efficacies of the boceprevir-based regimens were assumed to be the upper limits of the confidence bounds, and the efficacy of PR48 was assumed to be the base case value, both BOC/RGT and BOC/PR48 became cost-saving compared to dual therapy. Compared to treatment with PR48, the ICERs from the multivariate sensitivity analyses ranged from $2,338 to $33,511 for BOC/RGT and from $21,016 to $117,395 for BOC/PR48 (Table 4). The ICERs are most sensitive to assumptions concerning the quality of life of the HCV health states (range: $10,906–$31,124/QALY for BOC/RGT vs. PR48; range: $34,927–$108,965/QALY for BOC/PR48 vs. PR48) and least sensitive to assumptions concerning the quality of life of patients on treatment for those who receive BOC/RGT (range: $16,724–$16,819/QALY) and quality of life of the general population for patients who receive BOC/PR48 (range: $54,133–$56,228/QALY). The results of the corresponding probabilistic sensitivity analysis are described in the cost-effectiveness acceptability curves (Figure 3). Compared to treatment with PR48, and using an incremental cost-effectiveness ratio of $50,000 per QALY as a threshold, treatment with BOC/RGT was cost-effective in 99.9% of the simulations and treatment with BOC/PR48 was cost-effective in 51.9% of the simulations. Using an incremental cost-effectiveness ratio of $100,000 per QALY as a threshold, treatment with BOC/RGT was cost-effective in 100% of the simulations and treatment with BOC/PR48 was cost-effective in 99.5% of the simulations. Cost-effectiveness acceptability curve of SPRINT-2 treatment strategies. BOC/RGT vs. PR48 and BOC/PR48 vs. PR48. PR48 – peginterferon-ribavirin regimen for 48 weeks; BOC/RGT – peginterferon-ribavirin and boceprevir for 24 weeks, and those with a detectable hepatitis C virus (HCV) RNA level between weeks 8 and 24 received peginterferon–ribavirin from week 28 to week 48; BOC/PR48 –peginterferon–ribavirin for 48 weeks and boceprevir for 44 weeks. In the non-black cohort, treatment with both boceprevir-based regimens were projected to result in a gain of approximately 0.64 QALYs over those obtained with PR48 treatment (Figure 4, Table 5). This corresponds to ICERs of $15,067/QALY and $56,013/QALY for the BOC/RGT and BOC/PR48 treatment regimens compared to the PR48 regimen, respectively. In the black cohort, treatment with BOC/RGT was projected to result in a gain of 0.47 QALYs and treatment with BOC/PR48 was projected to result in a gain of 0.68 QALYs over those obtained with PR48 treatment. This corresponds to ICERs of $30,627/QALY and $50,423/QALY for the BOC/RGT and BOC/PR48 treatment regimens, respectively, when compared to treatment with PR48. The ICER of BOC/PR48 compared with BOC/RGT in treating black patients is $94,610/QALY. Cost-effectiveness frontier of SPRINT-2 treatment strategies. BOC/RGT vs. PR48 and BOC/PR48 vs. PR48 for all patients and by race cohort. PR48 – peginterferon-ribavirin regimen for 48 weeks; BOC/RGT – peginterferon-ribavirin and boceprevir for 24 weeks, and those with a detectable hepatitis C virus (HCV) RNA level between weeks 8 and 24 received peginterferon–ribavirin from week 28 to week 48; BOC/PR48 –peginterferon–ribavirin for 48 weeks and boceprevir for 44 weeks. The analysis comparing the boceprevir label recommendation relative to dual therapy resulted in an average increase of $18,047 in cost and 0.66 in QALYs and the corresponding ICER was $27,265/QALY (Table 5). PR48 – peginterferon-ribavirin regimen for 48 weeks; BOC/RGT – peginterferon–ribavirin for 4 weeks followed by peginterferon-ribavirin and boceprevir for 24 weeks, and those with a detectable hepatitis C virus (HCV) RNA level between weeks 8 and 24 received peginterferon–ribavirin from week 28 to week 48; BOC/PR48 –peginterferon–ribavirin for 48 weeks and boceprevir for 44 weeks. In our model, we assumed that SVR is a cure for mild and moderate HCV and that patients who achieve an SVR through AV therapy will not be at risk for developing serious and costly complications associated with HCV. There are a small number of studies which suggest that patients with moderate HCV may develop HCC even after achieving an SVR with drug therapy [37, 38]. The limited data suggests that the probability of this transition is very close to zero. Because of the limited information and since the transition is negligible, we did not include it in our model. Data also suggests that cirrhotic patients may have a regression of fibrosis if they achieve an SVR, which would lower their risk of developing HCV-related liver complications. A recently published study by van der Meer et al. showed that the all-cause mortality rates in patients who achieved SVR and who did not achieve SVR were 8.9% and 27% at 10 years, respectively. They also reported that 10-year cumulative incidence rates of HCC and decompensated cirrhosis in patients who achieved SVR were 5.1% and 2.1%, respectively. In our analysis, we also included a progression of disease in cirrhotic patients who achieved SVR, and the incidence rates reported by van der Meer et al. were included in our sensitivity analysis range. SPRINT-2 demonstrated that the addition of boceprevir to peginterferon alfa-2b and ribavirin after a 4-week peginterferon─ribavirin lead-in period significantly increased SVR rate over treatment with peginterferon─ribavirin alone in previously untreated adult patients infected with HCV genotype 1. However, the boceprevir-based treatment regimens themselves are more costly than treatment with peginterferon and ribavirin alone. Given the scarce resources and competing demands, payers often need to consider the long-term impact that treatment will have on the clinical and economic burden of disease. Our modeling study assessed the cost-effectiveness of the boceprevir-based strategies studied in SPRINT-2 over the lifetime of patients from the payer perspective. We also examined the impact of the FDA-approved label-based strategies on the incidence of HCV-related complications, lifetime costs, QALYS, and assessed the cost-effectiveness of these regimens. Our model estimates that treatment with PR48 is associated with considerable reductions on the incidence of serious liver complications compared to no treatment and is cost-effective at commonly used thresholds. However, our model projections indicate that treatment with boceprevir-based regimens offer substantial additional benefit. A difference in the incidence rates of serious liver disease between boceprevir-based regimens and PR48 was projected to occur within 10 years following treatment (Figure 2). Hence, although the AV therapy costs of BOC/RGT and BOC/PR48 are considerably greater than the AV therapy costs of PR48, a savings in the projected costs of managing HCV-related liver disease is expected to offset some of the drug costs. The ICERs of the BOC/RGT and BOC/PR48 treatment regimens compared with PR48 were $16,792/QALY and $55,162/QALY, respectively. Thus both BOC/RGT and BOC/PR48 are considered cost-effective at commonly used thresholds . In addition, the ICER of BOC/PR48 compared with BOC/RGT was $807,804/QALY, which implies that BOC/PR48 is not cost-effective at commonly used thresholds when compared to treatment with BOC/RGT. The high ICER obtained from comparing BOC/PR48 to BOC/RGT is mostly explained by the small difference in SVR rates between the two treatment strategies (BOC/PR48: 66% vs. BOC/RGT: 63%) and the difference in AV therapy costs (BOC/PR48:$69,928 vs. BOC/RGT: $47,582). Describing the natural history of chronic HCV has been historically difficult because acute infection is often asymptomatic, and the duration between infection and development of advanced stages of liver disease is typically long . Because of the variability of the estimates reported in literature and potential variability in treatment efficacy, we conducted sensitivity analyses on the majority of model inputs – treatment efficacy, transition rates, health state costs, and the quality of life associated with the health states. Results on the costs, benefits and cost-effectiveness of treatment varied widely across the different scenarios considered. The majority of one-way sensitivity analyses did not substantially impact the ICERs compared to the base case analyses. Only 5 of the 103 scenarios evaluated resulted in an ICER comparing BOC/RGT to PR48 that was more than $5000 different from the base case analysis ($16,792/QALY). Specifically, assumptions regarding the utility of the SVR-F1 health state, efficacy of PR48 and BOC/RGT, and the discount rates were most impactful on the ICER. Similarly, only 18 of the 103 scenarios evaluated resulted in an ICER comparing BOC/PR48 to PR48 that was more than $5,000 different from the base case analysis ($55,162/QALY). Specifically, assumptions regarding the transition rates from F4 to DC and F4 to HCC; utility of the F1-F4, SVR-F1, SVR-F2 health states; efficacy of PR48 and BOC/PR48; and the discount rates were most impactful on the ICER. These results imply that in comparison to treatment with dual therapy, the ICERs of BOC/RGT and BOC/PR48 are robust if a single model parameter is changed. Multivariate sensitivity analyses found that there is more variability in the cost-effectiveness ratios associated with BOC/PR48 vs. PR48 treatment than in the cost-effectiveness ratios associated with BOC/RGT vs. PR48. The ICERs were most sensitive to assumptions concerning the quality of life of the HCV health states and least sensitive to assumptions concerning the quality of life of patients on treatment for those who receive BOC/RGT, and quality of life of the general population for patients who receive BOC/PR48. The most favorable results for BOC/RGT and BOC/PR48 were generated when a discount rate of 0% was applied to both costs and utilities, whereas the least favorable results were generated when the lower bounds of the SVR health states were assumed. The PSA allowed us to evaluate the impact of varying the values of several parameters simultaneously on the projected long-term costs and QALYs of each treatment strategy at a variety of thresholds. Compared with PR48, BOC/RGT was cost-effective in nearly 100% of the 10,000 simulations when a threshold of $50,000 was chosen. 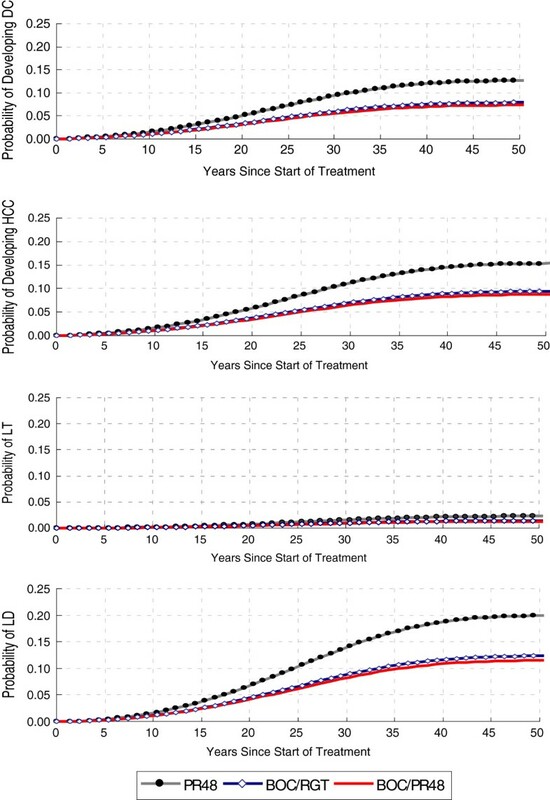 This suggests that BOC/RGT offers the opportunity for a shorter duration of treatment than dual therapy that is significantly more efficacious and cost-effective at a threshold of $50,000 under a variety of assumptions. Because of the differential treatment efficacy of dual therapy reported in non-black and black patients, data for these cohorts were collected and analyzed separately in the SPRINT-2 efficacy analyses. Although the reported SVR rates differed between the cohorts, the results of our cost-effectiveness study indicated similar trends within the results of the two subgroups. For both subgroup analyses by race cohort, compared to treatment with PR48, the ICER corresponding to the BOC/RGT treatment strategy was better than the ICER corresponding to the BOC/PR48 treatment strategy. The ICERs corresponding to BOC/PR48 compared with PR48 for both race cohorts were similar - $50,423 and $56,013 for the non-black and black cohorts, respectively. There was a greater difference in the ICERs between the boceprevir-based treatment strategies compared to dual therapy for the non-black subgroup than in the ICERs in the black subgroup. This is because the efficacies between the two boceprevir-based regimens are very similar even though the treatment cost of BOC/PR48 is much greater than the treatment cost of BOC/RGT. This implies that a longer duration of treatment may not result in additional clinical benefits. Conversely, treatment with BOC/PR48 resulted in an incremental gain of 0.21 QALYs compared to treatment with BOC/RGT in the black population. This implies that a longer duration of treatment with boceprevir may result in additional clinical benefit for black patients as is supported by the cost-effectiveness frontier (Figure 4). The treatment strategies recommended in the FDA-approved boceprevir label include futility rules consistent with the guidelines of AASLD . The ICER for the label-based treatment recommendation was $27,265 which implies that the label-based treatment recommendation is cost-effective at a reasonable threshold when compared with dual therapy. This indicates that the boceprevir-based treatment strategy offers great clinical benefit for the cost that is incurred. Compared to previously published cost-effectiveness models [22–26], our modeling study made several updates in the model structure and inputs. First, we incorporated treatment strategies that include boceprevir – a recently approved protease inhibitor which offers the opportunity for a shorter duration of therapy and significantly greater chance of attaining a cure. In addition, we updated the transition probabilities associated with progression of HCV, development of serious liver disease, the probability of receiving a liver transplant, and health state costs using data that was not previously available. Finally, unlike the majority of previous models, we included treatment of patients with cirrhosis in our model. We assumed that cirrhotic patients achieved a partial cure from HCV even if they attained SVR with treatment. This feature of our model –that patients with cirrhosis who achieve SVR are at risk of developing decompensated cirrhosis and hepatocellular carcinoma – was not incorporated in the majority of previous models. After we developed our model, Liu et al. 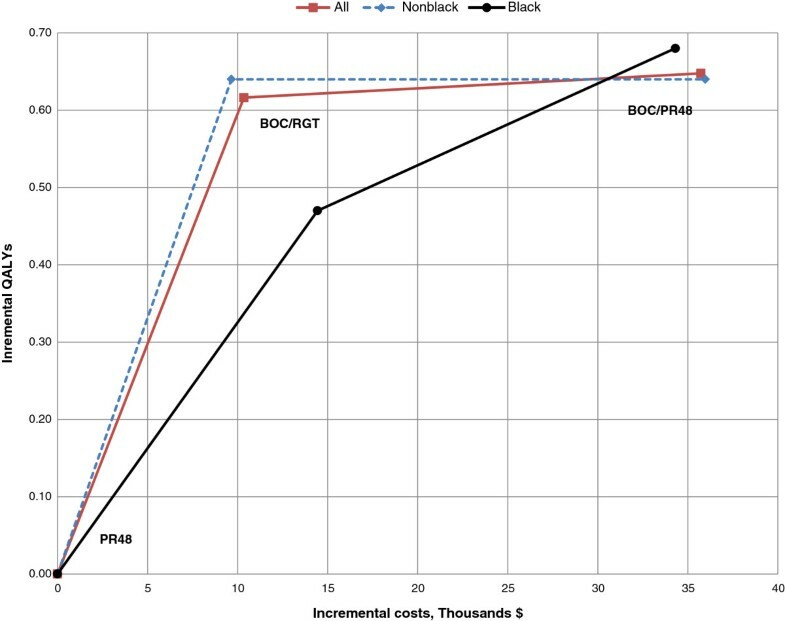 published a cost-effectiveness modeling study that included the costs and efficacy of recently approved protease inhibitors in the treatment regimen . 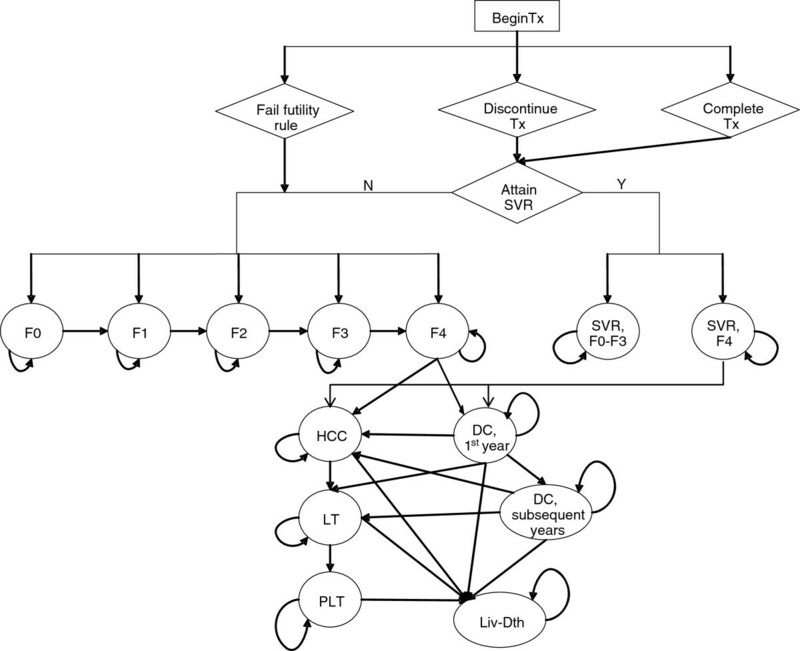 Our model differs from this modeling study in several ways. Specifically, the transition probabilities and health state costs included in our model are based on more recent data than those applied in the Liu model. Unlike Liu et al. which included cost for HCV with SVR and out-of-pocket expenses as part of the base case scenario, we only tested the influence of cost for HCV with SVR in the sensitivity analysis and we did not consider out-of-pocket expenses. Although the Liu model includes treatment of patients with cirrhosis, it was assumed that patients with cirrhosis who achieved an SVR were permanently cured of HCV. We assumed that patients with cirrhosis achieved a partial cure from HCV even if they attained SVR with treatment, which is consistent with recently published data . Finally, we also evaluated the treatment regimen recommended by the FDA and AASLD for boceprevir, not just the treatment regimens studied in SPRINT-2. Our study has several limitations. First, we did not model the possibility of retreatment with antiviral drugs that are currently available or might become available in the near future. Assumptions could be made concerning the timing of re-treatment in patients who received dual therapy in SPRINT-2 using data collected from a trial in previously treated patients (RESPOND-2) . However, the efficacy of re-treatment for patients who did not achieve an SVR with one of the boceprevir-based regimens is unknown. Second, our model did not take into consideration the possibility of re-infection nor re-transplantation in patients who receive a liver transplant. These patients are at increased risk for developing future liver complications and receiving subsequent liver transplants. Since re-transplantation would occur further in the future, its influence on costs and benefits would be heavily discounted. This suggests that the inclusion of re-transplantation would have a favorable but small impact on the cost-effectiveness of boceprevir and that the current modeling study provides a conservative estimate of the cost-effectiveness of boceprevir-based regimens. Third, our model cannot be applied to special populations such as patients co-infected with HIV because of lack of data on the impact of treatment with boceprevir-based regimens at this time. Fourth, our study applies the all-cause mortality rate to patients with chronic HCV and to patients who attain an SVR. Subsets of this patient population are considered high-risk and the mortality rate of the general population may underestimate the mortality rate of the HCV treatment population. Our model also does not take into account that patients who attain an SVR are at risk for reinfection with HCV. This assumption may bias the results in favor of boceprevir-based regimens since the boceprevir-based regimens reported higher SVR rates. Sixth, our model does not take into account that patients who do not achieve an SVR with AV therapy may receive some benefit, such as a slower disease progression rate. The impact of relaxing this assumption on the results is not clear a priori. Seventh, this analysis was done from the payer perspective. Patients with chronic HCV or the sequelae of cirrhosis have been shown to experience increased work and productivity losses, suffer activity impairment, and incur increased indirect medical costs compared with people without HCV [61–63]. Inclusion of such costs would result in lower ICERs for both boceprevir-regimens compared with dual therapy since the treatment efficacy of both BOC/RGT and BOC/PR48 are greater than the efficacy of treatment with PR48. Finally, all treatment characteristics are based entirely on clinical trial data. The discontinuation rates, which impact treatment efficacy, may differ in clinical practice. In summary, boceprevir-based regimens were projected to substantially reduce the burden of liver-related complications such as decompensated cirrhosis, hepatocellular carcinoma, liver-related mortality, and liver-transplants in treatment-naïve patients infected with hepatitis C genotype 1. Our model also demonstrated that boceprevir-based regimens offer patients the possibility of experiencing great clinical benefit with a shorter duration of therapy that may minimize the time patients experience an HCV-treatment decrement to their quality of life. In addition both BOC/RGT and BOC/PR48 were projected to be cost-effective from the payer perspective at a reasonable threshold in comparison with treatment with peginterferon and ribavirin alone. We thank Drs. John R. Cook and Erik J. Dasbach (Merck) for providing helpful suggestions regarding model development and for reviewing the model. We also thank Jane Liao (Merck) for providing programming support in the analysis of data from SPRINT-2 and Dr. Heather L. Sings (Merck) for assistance in the preparation of this manuscript. This study was sponsored by Merck Sharp & Dohme Corp., a subsidiary of Merck & Co., Inc., Whitehouse Station, NJ. This study was sponsored by Schering-Plough (now part of Merck Sharp & Dohme Corp., a subsidiary of Merck & Co., Inc., Whitehouse Station, NJ). All authors have completed the ICMJE Form for Disclosure of Potential Conflicts of Interest and report the following: Drs. Ferrante, El Khoury, and Elbasha are current employees of Merck Sharp & Dohme Corp., a subsidiary of Merck & Co., Inc., Whitehouse Station, NJ, and hold stock and/or stock options. Dr. Chhatwal is a former employee of Merck and has received consulting fees. Dr. Brass is a former employee of Merck and holds stock and/or stock options. Dr Poordad has received consultancy fees from Merck, Vertex, Abbott, Gilead, Achillion, Genentech, and Tibotec; has grants/grants pending from Merck; and has received payment for development of educational presentations and speaker fees from Merck, Genentech, Salix and Gilead. Dr Bronowicki has received consultancy fees from Schering-Plough (now part of Merck), Roche, Gilead, Bristol Myers Squibb, Janssen, Boehringer Ingelheim, Novartis, and Bayer; payment for lectures including service on speakers bureaus for Schering-Plough (now part of Merck), Roche, Bayer and Bristol Myers Squibb and travel/accommodations/meeting expenses unrelated to activities listed from Roche. The corresponding author had full access to all of the data and takes full responsibility for the veracity of the data and statistical analysis. CAB, designed the original SPRINT-2 study. SAF, JC, ACEK, and EHE developed the model. FP and JPB enrolled patients and/or contributed to data collection for the original study. All authors provided critical input to the draft. All authors reviewed the final draft and agree with its content.